In ReBirth, the body is used, bruised, and scratched – yet remains strong. The dialogue it establishes points out the historical use and traces of human bodies in the process and products of architectural construction. It interweaves theoretical references, conceptual aspirations and the artists’ separate practices, continuing concepts explored in Roberta Lima’s work, Into Pieces (2008) and in Fearghus O’Conchuir’s ongoing live and video work on the relationship between bodies and architecture in urban contexts. The installation was composed of the concrete sculpture, videos, photographs, and various performance objects. “The Burial” is a 30-minute video showing Lima writing the chronology of her collaboration with O’Conchuir on a sheet of paper, which was later placed on a thin layer of concrete, covered with a second layer, and cast inside a wooden mold. “Imprints” is a series of videos in which Lima and O’Conchuir used their bodies to transform and shape the wet concrete using gestures of falling, dropping, dragging, and crashing. During this part Lima also made a series of photographs using self-timer which lead her from the static-broken-body position into movements of standing up and walking away from the mold. 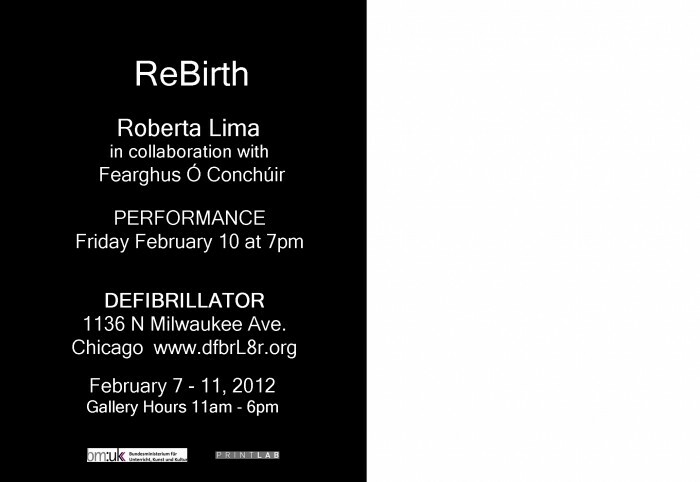 “Revelation” was performed live at Defibrillator on February 10th 2012, when Lima removed the concrete sculpture from the wooden base. Various tools were displayed with a sign inviting audience interaction -they broke and reshape the piece. They also dug into it: discovering the sheet of paper that was buried inside.